Northern Virginia remodeling company Moss Building and Design celebrates their 15th anniversary on July 21st. The award-winning contractor is family-owned and has seen their business flourish since their start in 2001. “What makes MOSS stronger than ever after 15 years? Our incredible team. 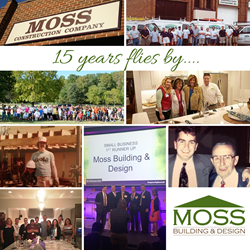 Northern Virginia remodeling company Moss Building and Design celebrates their 15th anniversary on July 21st. The award-winning contractor is family-owned and has seen their business flourish since their start in 2001. “What makes MOSS stronger than ever after 15 years? Our incredible team. I am very proud to be a part of it and look forward to many successful years to come as we work tirelessly to improve our customers’ lives in their homes,” said CEO Jason Hampel. Since 2001, MOSS has earned a multitude of awards and accolades and you can often find them featured in high-profile news publications such as Northern Virginia Magazine, Arlington Magazine, the Washingtonian and local outlets featuring their community involvement and HandyMOM101 events. They made national headlines with their NBC TODAY Show Mother’s Day Segment last year after finishing a kitchen remodel for Hoda Kotb’s mother in 7 days. While their public involvement can easily be seen by the Northern Virginia Community, MOSS has established a reputation built on trust and outstanding customer care. MOSS’ vision is to improve the quality of people’s lives in their homes and throughout their 15 years they have earned customers for life by staying true to their four guiding principles: High Quality, High Performance, Customer Focus and Fairness. These principles set them apart in an industry where trust does not come easily. “To have a successful long term business you have to start with a clear vision, stay true to it, and surround yourself with exceptional people who believe in the vision and strengthen the team executing on the vision,” said Hampel.